A massage wax for those lovely pregnant ladies everywhere! Apricot kernel and rosehip oils are combined with a hint of mandarin to make this lovely nourishing and safe wax. 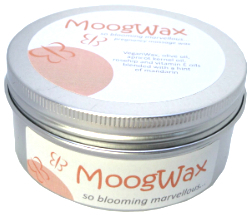 For that really special time, MoogWax so blooming marvellous is a celebration of pregnancy! Many essential oils and ingredients are contraindicated for use during pregnancy and so we have developed this gorgeous wax which is safe to use throughout pregnancy. Nourishing olive and apricot kernel oils are mixed with rosehip oil which is wonderfully effective at helping to prevent stretch marks. To this we have added a hint of mandarin essential oil - the only essential oil considered to be safe to use throughout pregnancy. Mandarin is also another oil that is great for preventing stretch marks. Perfect for pregnancy massage and also great for rubbing on pregnant bellies for keeping the skin soft, supple and stretch-mark free!